The perfect Thanksgiving side dish! 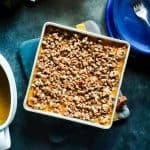 An amazing combo of creamy sweet potatoes, and crunchy sweet pecan topping. Preheat oven to 350 degrees. While the oven in preheating, bring a large pot of water to a boil. Remove skin then chop sweet potatoes into large chunks and add to pot of boiling water. Cover and simmer until sweet potatoes are very soft and cooked through. About 15 minutes. Drain cooked sweet potatoes and place in a large bowl. Add remaining ingredients and mash and stir together until smooth. Add to a 13x9 baking dish and prepare pecan topping. Sprinkle Pecan Topping over the sweet potato mix. Place in oven on the center rack and cook for 20 minutes. Serve Warm and Enjoy! Add all ingredients to a small bowl and stir to combine. Make sure the pecans are thoroughly coated with the brown sugar. Place on top of prepared sweet potato mix. If making this dish ahead of time cook the sweet potatoes and combine with the rest of the ingredients. Then smooth into baking dish and cover in the fridge. You can also make the pecan topping ahead of time. Just store everything together and store in a small airtight container in the fridge. Remove from fridge, add pecan topping and bake for 20 minutes. My grandma makes this dish the night before every year and it comes out perfect.